Saints highlights for week 10. Watch Saints highlights from the OMFL CFM. The New Orleans Saints dropped a Saturday afternoon playoff road game to the Philadelphia Eagles to wrap up a 10 win season. Season 80 ended in heart breaking fashion but the teams front office quickly got to work to improve their roster and make another run in one of the toughest divisions and conferences in the OMFL. The Saints went into the Business Season with over 42 million in cap room and very few draft picks, so action was required. The Saints were looking to grab a few extra draft picks and add a few more play makers and athleticism to both sides of the ball. To do that, the Saints made deals with the Bengals and Giants to add picks and players. The Saints went into Free Agency with a nice amount of money, but with specific goals and only looking for opportunities that fit their cap situation. A new power running back, some offensive line help, and some help on the defensive side of the ball. 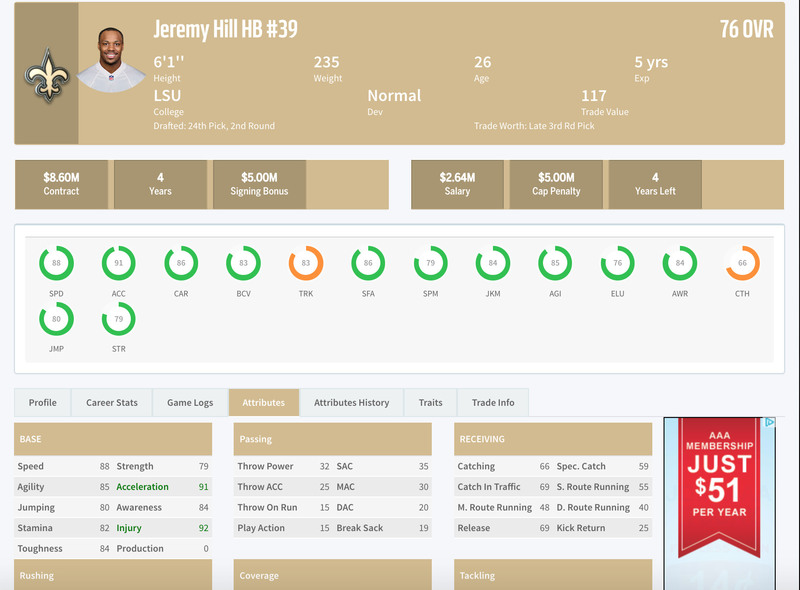 Jeremy Hill signed a great team deal to come back home to Louisiana. Hill will add youth and power to a backfield that lost Mark Ingram this past offseason. Hill will split time with Kamara as the team looks to stay healthy and establish the run early and often. Chance Warmack would sign a deal to come to New Orleans and help create some depth and add some strength to the Saints offensive line. Chance will be primary backup at several positions. 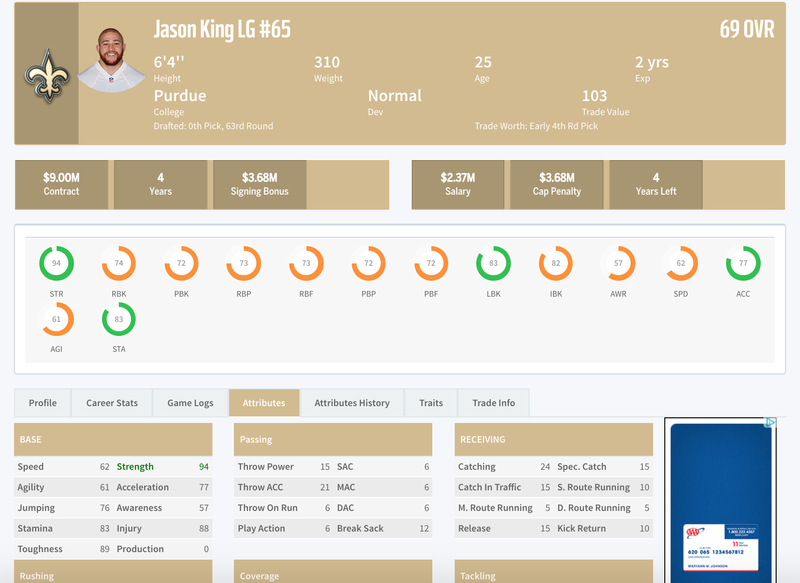 Jason King would also sign with the Saints, a deal the team didn't count on getting. King also had a deal from the Bengals, who offered King more money, but King decided the south was more his style and signed even a lower contract. 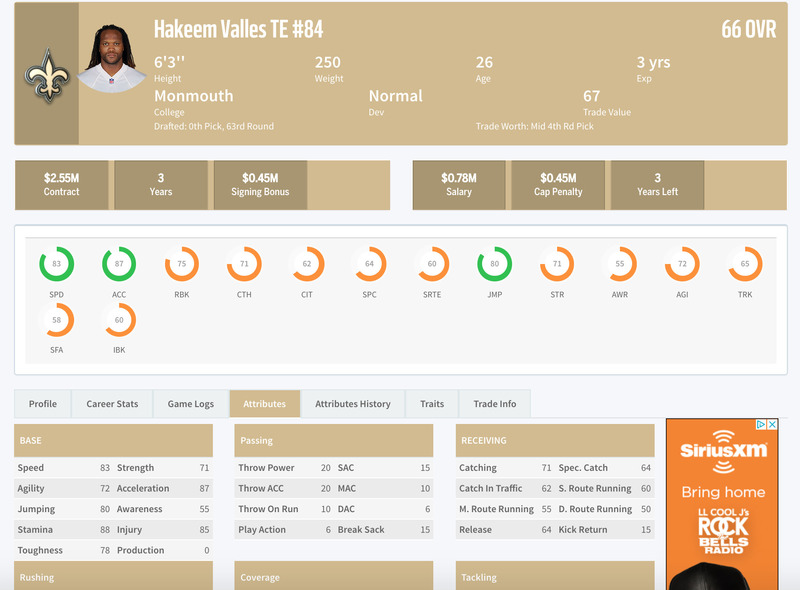 The Saints were also looking to add some needed depth to their Tight End position, so the team went out and signed blocking TE - Valles. Valles will come in and take the place of an aging TE position for the Saints this past season. The team will need to work on Valles hands to get him involved in the passing game, but the coaches and scheme should fit him nicely. Lastly the Saints wanted to continue to add some depth to their defensive backfield. The Saints defended the past well last season, but every team in their division got better on the passing offensive side of the ball, and the Saints wanted to ensure their numbers; adding Mager will do just that. 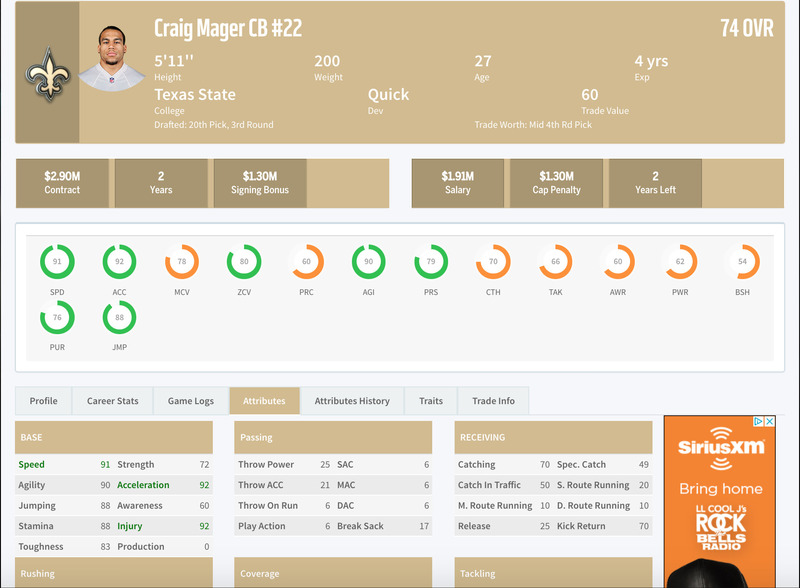 Mager will add size and speed and this preseason he has shown some great play making ability that will be needed in the Nickel and Dime formations. With 6 picks, the Saints scout team went to work to find the best talent available. With the need of offensive line, the Saints front office watched as a run of the top offensive line players went off the board before their first pick. With the adjustment of the draft board, this meant the Saints could take best player available and turn their attention to upcoming expiring contracts that could be replaced with younger players. 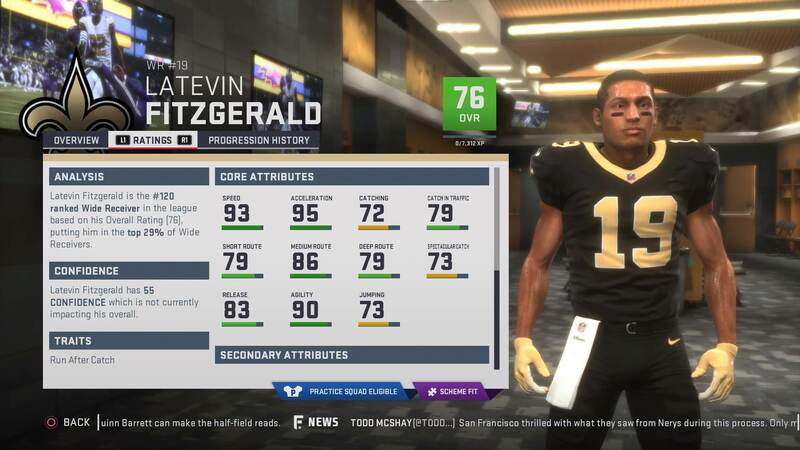 First up the Saints took the best Wideout on the board in Fitzgerald. 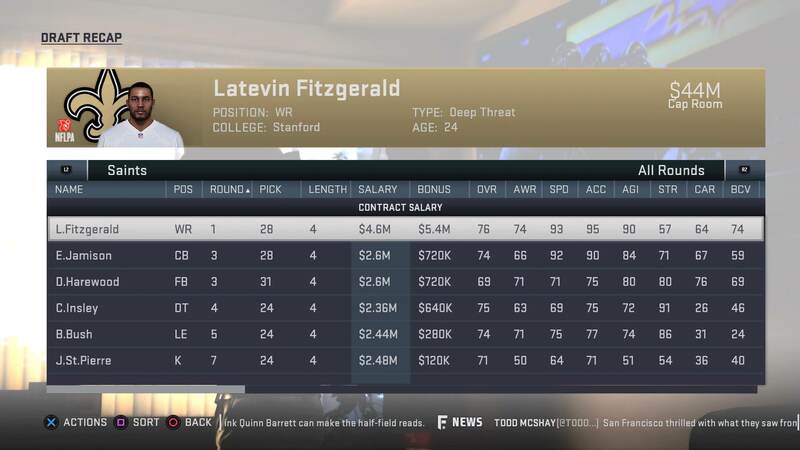 Fitzgerald adds size, speed, and big play ability to a team who has gotten younger and faster this Business Season. Fitz showed off these skills in a 4 catch, 112 yard game with 1 touchdown in their last preseason game against the Bills. 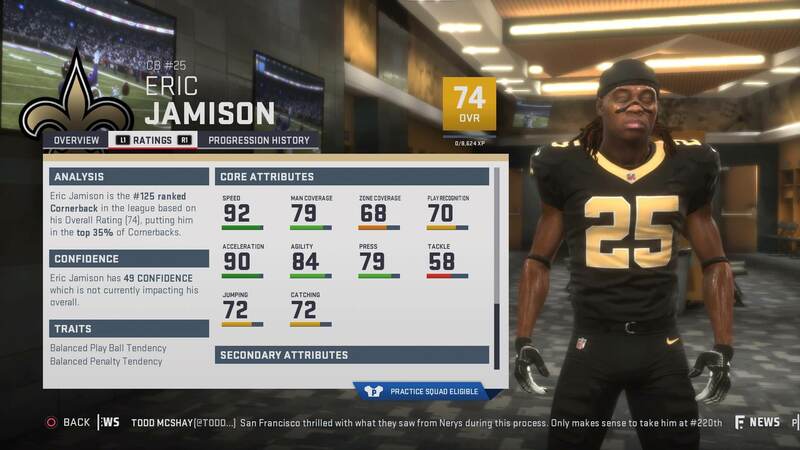 Fitz will battle for a starting position, but could also slide right into the slot with the release of Pro Bowler Ted Ginn Jr.
With their 3rd round pick, the Saints took the best CB and highest rated player on their board - Eric Jamison. Eric also adds special teams ability but will need some time before he can crack the starting lineup. 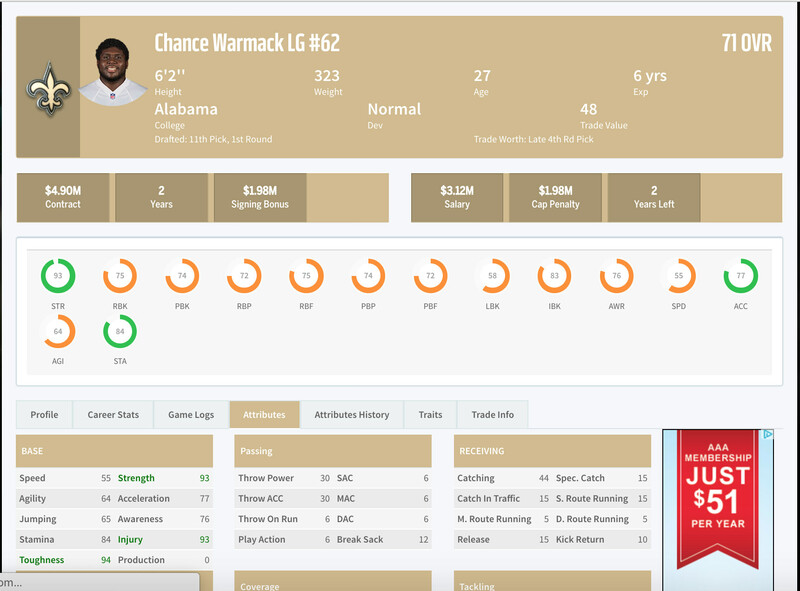 Overall this pick fits well as a 74 overall player in the 3rd round, and gives the Saints some firepower and youth in that defensive backfield. 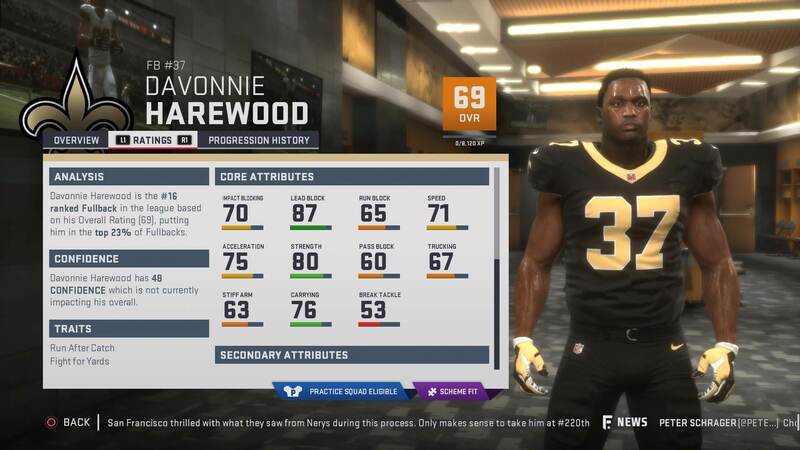 Harewood was one of the top 2 play-making full backs in this years draft, and the Saints took a chance. With an aging FB on the roster, the Saints couldn't pass up Harewood's potential. Harewood will step into the starting line-up to open holes for Karma and Hill. 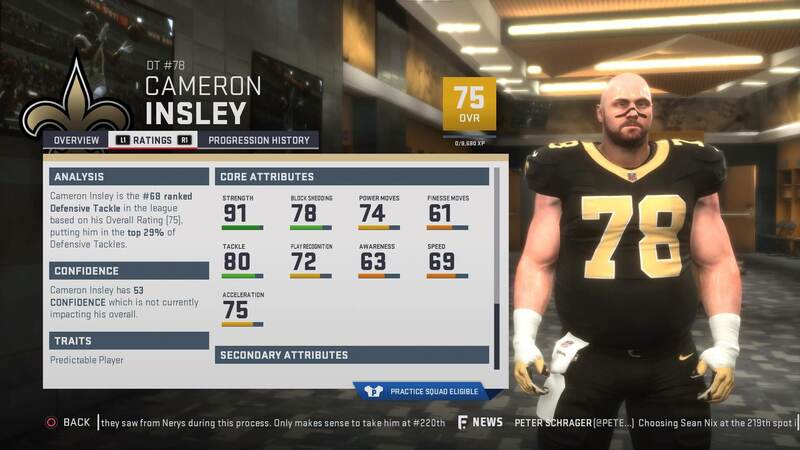 With one of their last late round picks, the Saints took BPA in Defensive Tackle Cameron Insley. Cameron was a home run for this late in the draft and comes in at 75 overall. Cameron adds strength and size with some pass rushing ability. Cameron will battle for a spot and should get some Nickel and Dime formation play time. 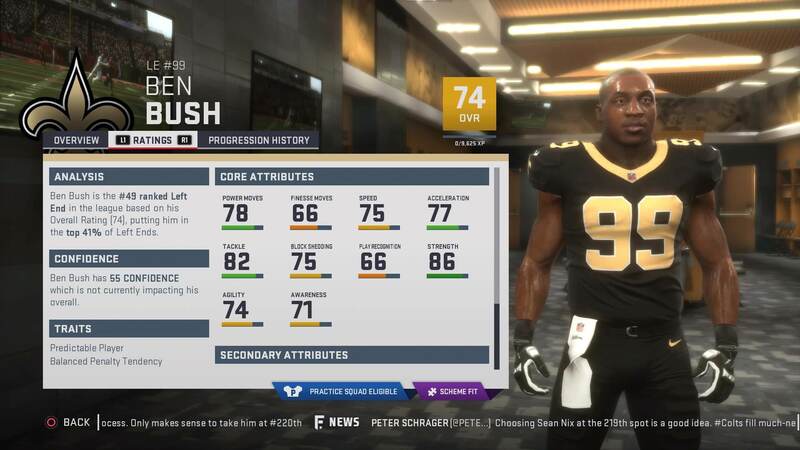 Ben Bush would be the Saints 5th round draft pick and would be another really strong pick for the Saints at 74 overall. Ben will be the primary backup at both end positions with 86 strength, 75 block shed, and 82 tackle. Ben has made some nice plays, including 3 sacks this preseason. 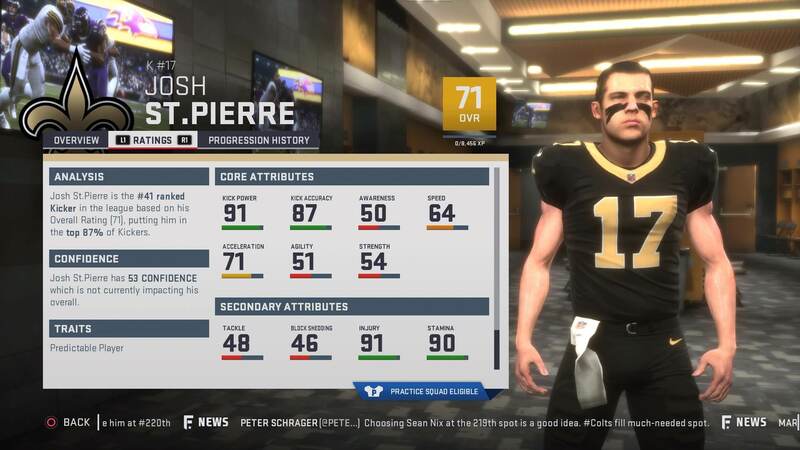 With their last pick of the draft, the Saints took Kicker Josh St. Pierre, who they will move to punter as they part ways with long time Saints punter Thomas Morestead. This will take a large cap hit for the Saints but save much needed cash with large contracts coming up over the next few seasons. After the draft was over, the Saints scouting department went to work to help fill any remaining needs and the Saints Practice Squad. 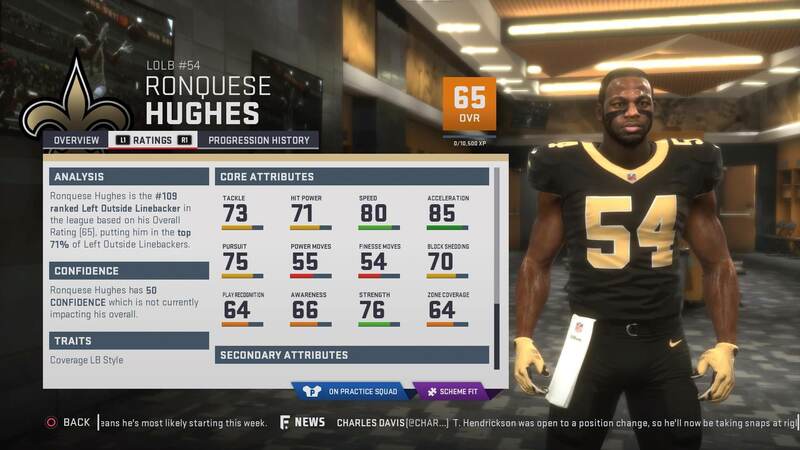 The scouting department was able to sign rookie outside linebacker Ronquese Hughes to the team. Hughes will get a primary backup position with his man and zone coverage abilities. 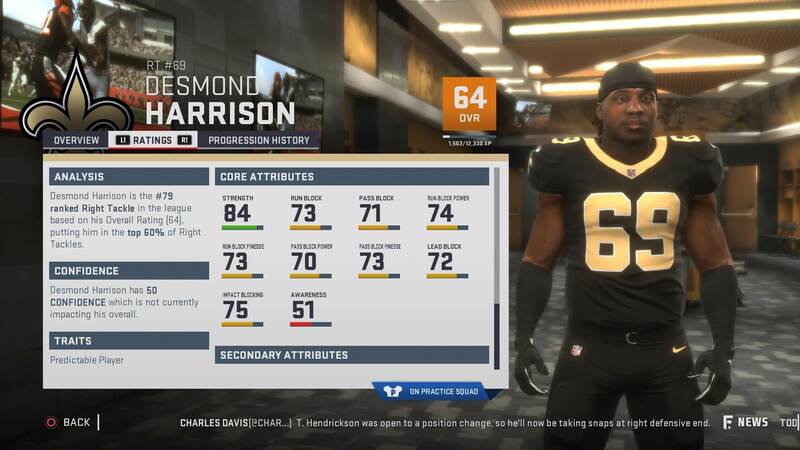 The Saints would also sign Desmond Harrison to be apart of their PS. The Saints coaching staff likes his core abilities and feel that with a season under his belt, he could provide some needed depth to their offensive line. 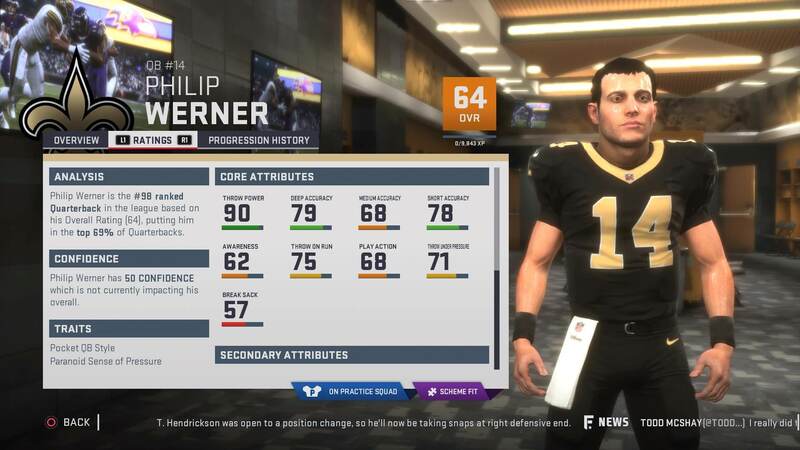 Quarterback Philip Werner will come in and help the Saints scouting team. Philip is a pocket passer with a big arm and nice deep accuracy. Saints coaching staff has liked what they have seen in practice. 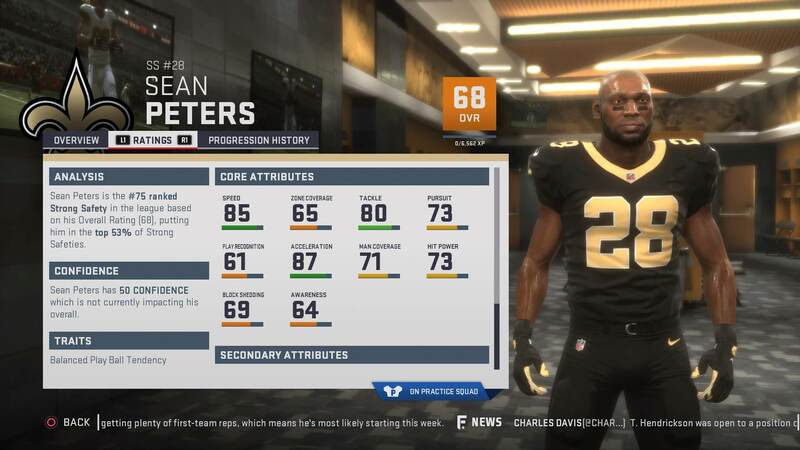 Sean Peters would round out the Saints PS, as the team added the big hitting safety who brings size and great man coverage ability to the team, which the coaching staff can groom and build on. After an up and down but overall successful Season 80, the Saints are looking to finish off a few position battles and hit the ground running in Season 81. Their schedule will not help them though, with almost all playoff teams from this past season, in both AFC and NFC, on their schedule. Giants, Titans, Texans, 49ers, Colts, Vikings, Jags, and Seahawks to go along with the NFCS, means the Saints will have to play perfect football to have a successful season. It all begins tonight with Season 81 kicking off and the Giants on the schedule. Join Nate as he hosts DaddyLeauges Podcast - The Talk, this week with some of the leadership team of the Madden Bomber League. The guys will talk M18, M19, CFMMovement, Commish talk, and more. Give us a like and subscribe. DaddyLeagues Podcast - The Talk, this week with Superman of the Madden League Digital Football. The guys will talk M18, M19, CFMMovement, Commish talk, and more. EA released their deep dive blog for CFM's! Check out what they have to say and leave us your thoughts. We'll break more down in a later video. DaddyLeague Podcast - The Talk - Madden 19 Info! Listen as Nate breaks down the latest information to drop about Madden 19 from E3. This information came from the following sources. Make sure to give them a watch/read.